2016 has been a year of experimentation and actual implementation coupled with hands-on consumer experience of innovations in technology. It’s been a year where we are experiencing the connected world, all thanks to the devices that we have been using, and particularly digital transformation. Various technology powerhouses have been monopolizing over diverse aspects of technology. Microsoft remains the ultimate choice for software and to build an all-inclusive computer system, Apple continues to master the high-end portable computers/devices domain, and then the unbeatable Android Operating System that has almost taken over the smartphone market with its popularity and pricing. Every technology in every segment is gaining excellence and the desired market share. It is addictive and a technology buff will always end up owning any and every new device in the market whether it is a need or a want. What makes technology so indispensable? The U. S. Technology Device Ownership Survey by the Pew Research Center states that a typical American owns a wide range of devices, namely, desktops, laptops, smartphones, gaming console, ipods, etc. The question is, why can’t a single device bring an all-inclusive experience for the user? Can’t a well-connected and upgraded desktop play good music, support gaming, and help catch up on a movie from Netflix? Except the portability factor, the irony of the connected world is that it still doesn’t help bring a wholesome experience. For instance, you know that an average desktop cannot provide you the gaming experience, comfort of reading a book on Kindle, experience of watching a movie, acoustics of an EDM, and so on that you would expect from your respective devices. Is there any mechanism or a technology approach that can ensure a holistic and integrated experience? Can Virtualization/Cloud solve issues related to integration and experience? Tech Target (a popular tech portal) describes Virtualization as a technology where an application, guest operating system or data storage is separated from the actual hardware or software under scrutiny. Specifically, server virtualization uses a software layer that emulates the original hardware. Service Virtualization helps create virtual rather than actual form of any component, for instance, an operating system, a server, a storage device, or any resource under scrutiny. Literally, it enables you to create a digitized version of any device. At the same time, it ensures that the efficiency of emulators is maintained so as to deliver the required results. It may lead to issues like insufficient control, irregular crashes, compatibility issues, and more. But what if the entire software/operating system is hosted on the Cloud, and can be tested or experienced on any device of your choice? This could help surpass the hardware gap swiftly by loading everything on the Cloud, as any device could be just an enabler to view the functioning of the software/application. In this way, virtualization of software helps bridge the widening gap between technology and devices to help attain Quality. Service Virtualization is a method implemented to emulate behaviour of components across various applications, such as API-driven application, Cloud applications, and Service Oriented Architectures (SOA). It is mainly utilized by QA and Testing teams to gain access to various dependent components required to assess the Application Under Test (AUT). When dependent components are ‘virtualized’, testing and development teams can proceed without retrieving the real/LIVE components. This helps in keeping the testing environment consistent while the application is tested for efficiency and quality. Following are some key benefits of Service Virtualization in terms of Quality Engineering. You can save substantial costs and time by not configuring the physical environments. It reduces footprints of physical servers and improves utilization of resources. It reduces expenditure on third party and access to physical environment. It cuts down the limitation of the test environment, as components are more scalable virtually. It makes Performance Testing more scalable. Service Virtualization mainly enables continuous testing to speed up the delivery process and automates the testing for complex applications way ahead in the development lifecycle. Incorporating testing and automating it way ahead in the development cycle ensures that quality is assured right from the beginning. Apart from this, Test Automation helps deliver overall functional, regression, load, and integration testing to address issues and challenges related to quality, specifically with complex and integrated applications. It works effectively with Service Virtualization by helping teams to automate integration testing for complex applications right from the beginning. This helps cut down testing hurdles and deliver superior quality software at speed and with market-readiness. 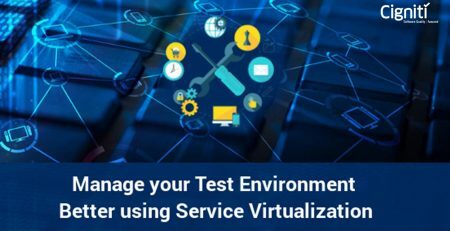 Service Virtualization boosts scalability and can provide access to the latest components for testing in the virtual space. It provides effective solutions for accessing key applications, using a preferred operating system and also performing advanced tasks from anywhere. The only requirement is, an uninterrupted data connectivity. Network Virtualization: It is a method of integrating the existing resources in a network by segmenting the available bandwidth into channels and further assigning it to a server or device in real time. Storage Virtualization: This is where physical storage from multiple network devices is pooled in to create a single storage device that can be managed centrally. It is particularly used for storage area networks. Server Virtualization: This entails management of servers to save the user from dealing with the complexities of server configurations during resource sharing. Data Virtualization: This separates the old technical details of data and manages data, providing access to much more applicable and relevance for specific business needs. Desktop Virtualization: The user gets access to the desktop from a distant location, making the process portable and accessible from anywhere. Considering the workstation is running in a data center, it makes the overall activity more secure. Application Virtualization: This separates the application layer from the Operating System, where the application can be executed irrespective of the OS running in the background. Virtualization can be perceived under the overall aura of Enterprise IT, which also incorporates Autonomic Computing. It is a set-up where the IT environment manages itself based on the expected activities. The overall objective of virtualization is to enhance scalability, and bring down costs associated with infrastructure and resources. Cigniti’s Testing Center of Excellence (TCoE) Framework is designed to provide a holistic and integrated approach towards testing. It is a proprietary framework that comprises core elements across the entire organization. We have Cloud-enabled labs for testing devices and application in the virtual environment. Connect with us to achieve improved efficiency, optimize people/tool utilization, and reduce testing costs. We give you a potent strategy to enhance and transform your quality engineering process. 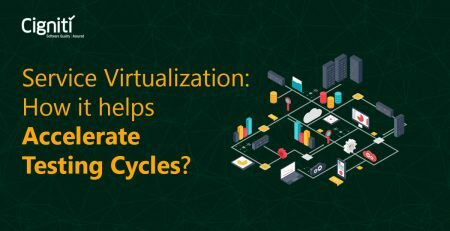 Service Virtualization: How it helps Accelerate Testing Cycles? 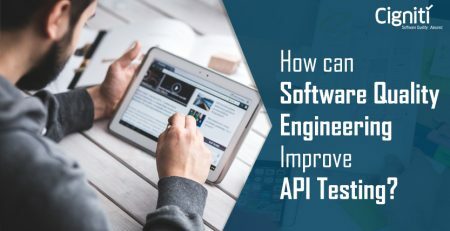 How can Software Quality Engineering improve API Testing?